This tea is produced by our fantastic tea producer Mr. Saito. His tea gardens are in Honyama, which many believe to be the area that produces the finest senchas in Shizuoka Prefecture. Saito’s tea fields are located in the mountains near the Warashina River. The environment of these tea fields is pristine and filled with natural beauty, healthy plants, birds, insects and all the good components of a thriving tea garden. Mr. Saito once again has given us a unique tea with particular characteristics. In appearance, the leaf is large and somewhat thick with some coarse bits and a larger particle size than many other Japanese senchas. This means that it holds up well in re-steeping and shows off its coloration well. The color is a dark pine green and the leaf has a nice matte finish. 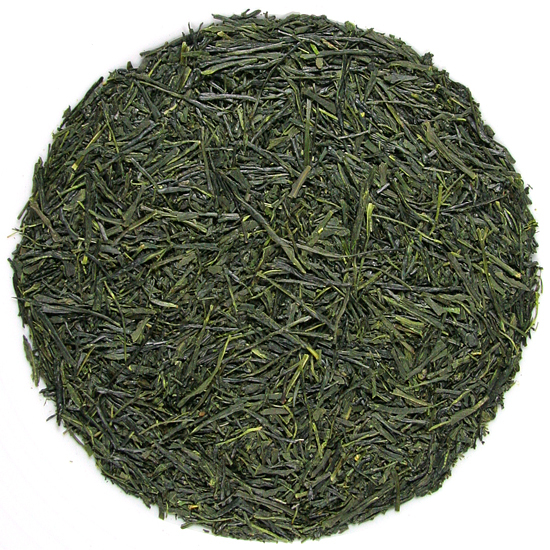 Sencha Okuyutaka is made from a Japanese tea bush cultivar that offers stylized, abundant taste and aroma. This tea has a ‘big personality’ in the cup! It has a bright and fresh, much more kelpy flavor with a taste that reminds the drinker of the sea and seaweed and a fantastic Japanese meal. The body is best described as ‘medium’ because this leaf is focused on providing the unique, complex flavors that make it distinctive. The color of the liquor is medium-straw.